A group of Dundee choir singers tuned up at Wellgate today (Thursday 9 November 2017), in preparation for their performance at next week’s Christmas lights switch on. 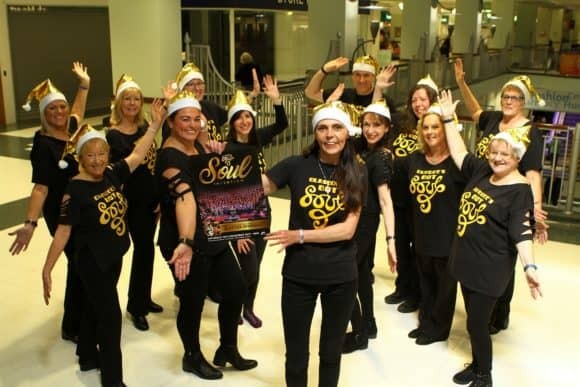 The singers from the city’s Got Soul choir were practising for their festive show as part of the event at Wellgate on Thursday 16 November 2017. Lisa Towers and Got Soul singers! The choir will sing a number of soul classics at 3.30pm on the day, when Wellgate will be transformed into a Winter wonderland with reindeer, snow, festive entertainment and, of course, the man himself, Santa! After going down a treat in previous years, resident reindeers, Jingle and Bell, will also make a welcome return. With Dundee schools off for in-service day, there will be ample time to come and meet them between 2-5pm outside the glass lift on Level 3. There will also be lots of family-friendly, seasonal activities to enjoy within the cosy confines of the Centre. With Santa’s grotto opening at 3pm, children can enjoy a not-to-be-missed mini show from Funbox from 4.15 until 5pm, after which the lights will be switched on and the snow will fall! Visitors will also be wowed by Dundee theatre school Stage Academy, local dancers, an acoustic set and Tay FM breakfast show’s Claire Kinnaird.